According to preliminary data, Illinois experienced its 11th warmest and 14th wettest June on record, and the heat, humidity and high precipitation continued at the beginning of July. The statewide average temperature for June was 75.0 degrees, 3.1 degrees above normal. The statewide average precipitation was 6.36 inches, 2.15 inches above normal, according to the Illinois State Climatologist. Statewide, June 2015 was the wettest on record with a statewide average rainfall of 9.44 inches. The greatest monthly total for this past June in Illinois was 14.58 inches at Rockford. In addition, the Rockford Airport reported 14.23 inches, their wettest June and wettest month on record. 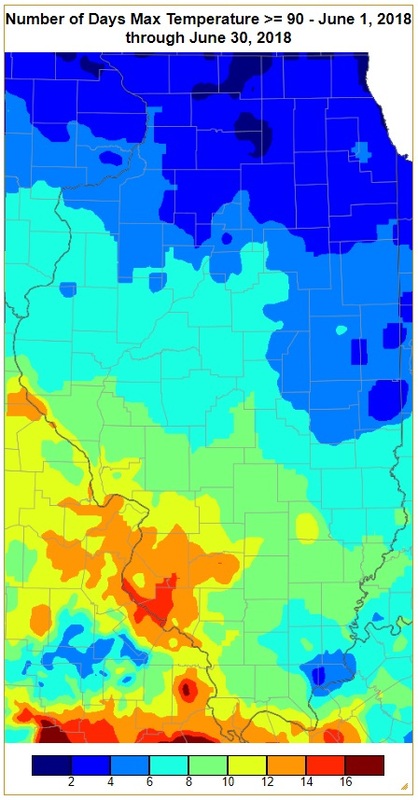 Based on radar and rain gage data, precipitation was especially heavy across northern, east-central, and southeastern Illinois with widespread amounts in the 10 to 14-inch range. This decade has seen some of the wettest Junes on record with six out of the last 10 years now listed among the highest participation levels since recordkeeping began in 1895. Meanwhile, July started off excessively hot across the state and the northern half getting slammed hard with heavy rains during the first week. The outlook for the rest of the month shows an increased chance of continued above-normal temperatures with precipitation levels likely near normal.